Manners are an important part of social skills in preschool. Children who develop manners at a young age will carry them without thought into adulthood. But, let’s understand something before anyone gets their hopes up. Manners may not be a priority in any way at home for some children. While that makes your job even harder, you need to be realistic and follow some basic guidelines. The most basic guideline is to lead by example. Though that pretty much says it all, let’s look at a few more guidelines. Don’t forget to thank people. You may be the best role model these children have. Preschoolers are learning by watching and listening. They practice skills by mimicking them. Give them something solid to mimic! Use very proper table manners. Preschoolers may not pick up on all the manners you are trying to teach them, but you can show them the very best and know that they will at least pick up on a percentage of them! Table manners can be difficult to teach if children don’t have a full-time role model that demonstrates them. Use this simple activity to teach social skills to toddlers by reinforcing positive behaviors and allowing older children to use their skills to help the younger ones. As you use positive reinforcement in teaching manners, remember to never use food for positive reinforcement. This can create poor eating habits and unhealthy thoughts of food. Set up a graduating table system, but be sure that no child eats alone. Use the buddy system if possible according to the ages and numbers in your group following the steps below. One table should be for newcomers and those who are at the first step of the system. Use this table to assess children’s table manners for about 3 days before moving them to the next table. An adult member of the staff should also be eating at this table to monitor and demonstrate proper table manners. The next table should be for those that have learned to use silverware and/or chew with their mouths shut. 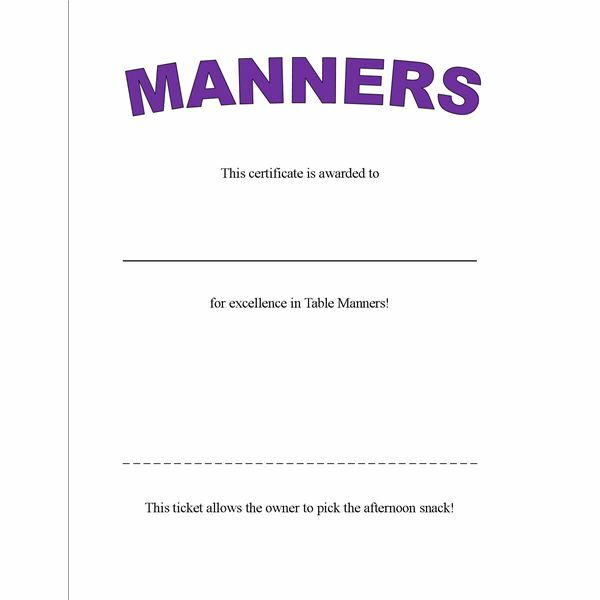 The printable certificate included with this activity should be awarded to children who have been moved to this table. In order for this system to work and be exciting for the children, the teacher and other children must make a big deal out of the action of graduating from one table to another. Older children should also assist younger ones when possible. Here are some tips on teaching good table manners. Show children how to place their finger over their mouths as if they were saying “shh”. This reminds them to eat quietly as well as allows them to notice when they are chewing with their mouths open. This sometimes helps younger children learn how to chew with their mouths closed. Older children and teachers can give the younger children the “shh” signal to remind them that they are chewing with their mouth open. Teachers should purposely wear hats every now and then so that they have to remove them and demonstrate to toddlers that hats should be removed at the table. Every now and then a teacher should “make a mistake” and place their elbows on the table, then “remember” out loud that they should not have their elbows on the table. If possible, schedule an outing where children can demonstrate their manners. Places like Ponderosa even offer discounts for groups and younger people! Use these activities and soon your preschoolers manners will exceed your expectations! Children will learn to behave at the table and will outshine even some adults with their manners!